Oh, I crack myself up! Can you hear an older man sternly saying that title in your head like I can? Can you actually HEAR it?! A couple days ago, my sweet friend Patricia asked me if I could make some last-minute cookies for a special dinner she held two nights ago. I said, “Sure!” right away, not even knowing for certain what design she might need! (A rookie error, by the way. Please be smarter than me!) 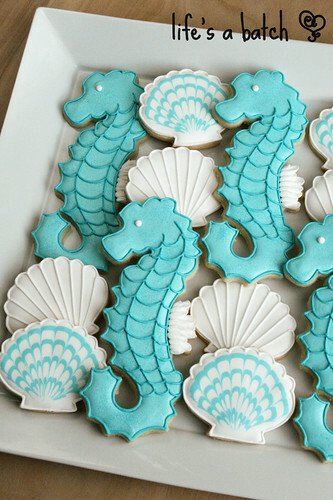 But she sent me a photo of some invitations she was creating from Pinterest, and I had enough to go on for some simple, elegant seahorse & seashell cookies. The seahorse cookie cutter is a ginormous one that I’d never gotten to use before (it’s about 7″ tall). I found mine in a clearance bin at Macy’s last fall (really! ), but you can also purchase one HERE online. I think mine must’ve already been squished a bit before I saw it, as my seahorse isn’t quite so chubby; rather, he’s a bit leaner, or possibly, not as pregnant?! « Dad, You Are Fan-tache-tic! 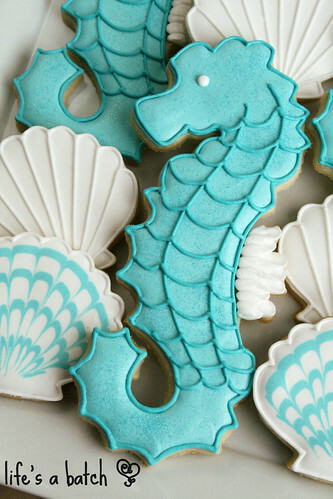 I LOVE the seahorses and seashell cookies. Wish I could make these. You’re very talented. Thank you, Debbie Rose! That’s very sweet of you. I’m wondering if you take orders for your cookies? 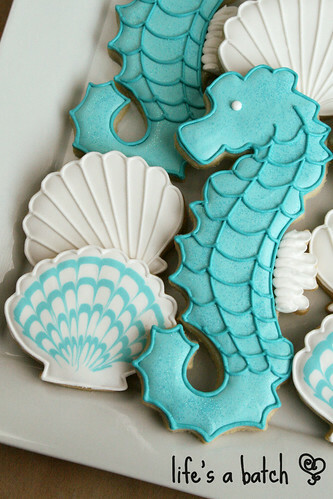 I would really love a dozen of your seahorse and seashell cookies and a dozen of dog and cat themed cookies. I do, Peggy! You can send me an email – nicole@lifesabatch.com – to order. Thanks so much!